Nourishing Hair Milk. Natural Hair Care. INDIGOFERA. Sheer Hair Lotion. 8oz. single bottle. Free Shipping. "So, far my favorite product! I've had bad experiences with lighter moisturizers either not really doing the job or being so heavy that they caused massive build up in my locs that only a major rinse could get out. Not so with the hair milk. Not only does it make my hair super soft, the very texture of my locs themselves have gotten softer as well." 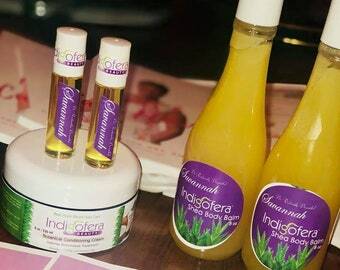 Transform dry, brittle, and unmanageable hair with Indigofera’s newest beauty solution! Our Nourishing Hair Milk is a sheer, moisture-rich cream formulated from pure aloe, virgin coconut oil, and luscious avocado oil. We added our lemongrass 100% essential oil to our Nourishing Hair Milk for a revitalizing citrusy aroma. Our luxurious plant based ingredients won’t weigh hair down or melt in the hot summer sun. A lavish way to love your tresses, Nourishing Hair Milk is perfect for transitioning, curls, twists, locks, and all natural styles. 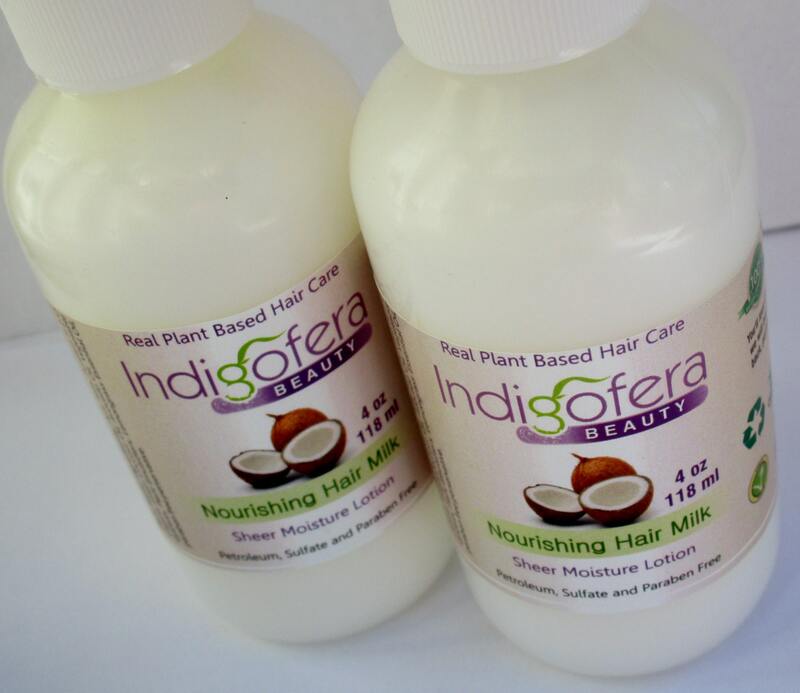 Bottled for You: Indigofera’s Nourishing Hair Milk is packaged in a convenient bottle for your dispensing ease and enjoyment. All Indigofera Hair Care products are petroleum and paraben free. We never use SLS, synthetic fragrance or dyes. Vegan. Premium formulas, infused with 100% Essential Oils. Hair Care Ritual: Nourish Apply Nourishing Hair Milk to damp tresses after cleansing with our Aromatic Hair Cleanser and restoring with our Botanical Conditioning Cream. Leave in and style as desired. During the week, continue to hydrate with hydrating hair mist and reapply Nourishing Hair Milk as needed for envious softness and shine! Plant Based Ingredients: Pure Aloe, Purified H 2 O Organic Virgin Coconut Oil, Avocado Oil, Vegetable Gylcerin, Plant Emulsifiers, Lemongrass Essential Oil, paraben free perservative. "This was a great buy. I find myself reordering these products alot. Way better than Carol's Daughter or Miss Jessie's--the ingredients are superior and they penetrate the hair, not lie on top of it. Mega moisture= NO BREAkage ladies!!!!" Convo me with questions, I am always happy to help. Shine. Nourishing Hair Serum. Natural Hair Oil. Lemongrass 1 oz.FREE SHIPPING. Natural Hair, Leave in Conditioner, Locs, Black Hair Products, Indigofera, Peppermint, Rosemary, 4C Hair, Free Shipping. Botanical Hairdress. Natural HAIR CARE. Perfect for dry scalp. 4 oz. Organic Hair Souffle 4 oz. Natural Hair Moisturizer. Coils. Kinks. Locs. Natural Hair Oil for Locs. 4 oz. Free Shipping. I will definitely be back. This smells heavenly, and it moisturizes your skin so nicely. Glad I came across this sight. As good as i remember. I love this trio right here. I am always get complemented on how good i smell when i wear them. Perfume Oil Roll on. Trio Set. Fragrance. Free Shipping. Love this product. smells great and feels refreshing on the scalp. Moisture Spray and Detangler. Natural Hair Care. Daily Lightweight Leave in. 8 oz Large Size. Single Bottle. Free Shipping. This product is a one of my favorite. It leaves my hair so soft and moisturized for days. Definitely will be a staple. Indigofera accepts PayPal Payments FYI you do not need a PayPal account to use this service, Master Card and Visa accepted. Please sumbit your payment within 3 hours of purchase, otherwise it may be relisted. Orders may be exchanged if we are notified of your request prior to shipment. I am committed to exceed your expectations. Indigofera plant based products eligible for refunds or returns I will do my best do resolve any concerns that may arise. I am happy to answer any questions. All orders are shipped with delivery confirmation to track your package. * I will also refund excessive shipping if you choose to place your order. I realize shipping if a major concern when shopping online. You have my promise to process your order as quickly as possible. I take pride in my client care, presentation and attention to detail. You will receive the freshest formulas that will wake up your senses! USPS is my method of shipment. Depending on order volumes, processing time is currently 3-5 business days. :) Thank you for your business!!! Please indicate in the comments special notes for the mail carrier. Yes we do ship to international customers! (So far I have customers in Canada London, Germany, Spain and The Netherlands) The buyer is responsible for customs and related fees enforced by their country. Please convo me if you need an estimate of delivery prior to ordering. If you have allergies to any ingredients, please read list carefully. We do not make medical claims on any of our products; they are intended for cosmetic use only. If you would like to discuss collaboration, please send a convo. Fragrance Free~~~~~~~~~~~~~~ Indigofera now blends custom batches of fragrance free hair care without essential oils. Perfect for those who like it plain and simple, or wear their favorite perfume. Please recycle your bottles, jars and packaging with your community recycling program. If you would like a product that is sold or a difference size option please convo me, I am happy to list it for you. Love Your Locs Sale. 5 pc Ritual Set. Natural HAIR Care Set. Large Sizes. Unscented Natural Hair Care Ritual Product. Coils. Kinks. Locs. Fragrance Free. Sensitive Skin. Loc Moisture Natural Hair Care Ritual Set. Best Seller. Pick Any 4.